Today at Nokia World 2013 in Abu Dhabi, United Arab Emirates, Nokia officially launched the New Nokia Lumia 1520. The New Nokia Lumia 1520 is the first Nokia Lumia with Large Display, comes with 6" large screen display completed with Corning Gorilla Glass 2, Support for 1080p and powered by Snapdragon 800 Processor, 2 GB of RAM and 20Mpx Pureview camera. 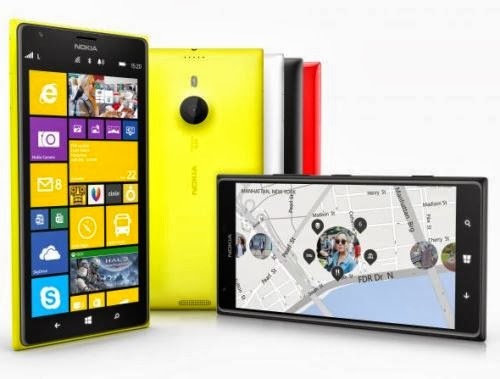 Nokia Lumia 1520 will available in 4 colors: Yellow, White and Black and Glossy Red. Bring your story to life with Nokia Lumia 1520 and its 6” 1080p full HD display. Capture high quality images with the 20MP PureView camera including the latest camera innovations from Nokia, like OIS, enhanced sensor technology, oversampling and zooming technologies. Camera integrates the most popular imaging modes, Pro, Smart, and video into one seamless picture taking experience. Capture full HD video with crystal clear audio thanks to the Rich Recording with four microphones for distortion free audio. Storyteller that automatically integrates your pictures from your phone with HERE location information and collates a chronological picture journey on a map. Microsoft Office onboard. Back the documents up to the 7GB of free and secure cloud storage via SkyDrive and pick up where you left with any device. See more on your home screen. A third column in the home screen allows you to bring more of the important live tiles to your home screen.